I admit it. I love the end of work on a Wednesday or Friday night. That is when the last trailer is loaded and out. Nothing like telling the boss that it’s loaded. Funny. We use that word “loaded” for describing a full trailer. In that regards, it is just a part of my daily job. Yes, I do enjoy what I do, but I do get grouchy too. However, we seem to use that term “loaded” for other things too. When somebody gets drunk, it is common enough to say that they got “loaded and wasted”. Another use of the term “loaded” is when we discuss somebody’s monetary status, in which case we simply would say that they are “loaded”. Kind of funny how we use this word for a couple of different things. Let me be clear, there is nothing in the Bible against drinking alcohol, nor against money. However, everything has its proper place. I have spoken before about money and we should not seek money as an end to itself. Money is merely a tool with no real value unto itself. There is nothing in the Bible that condemns anyone for having money. Rather, it is how we view money that is the problem. However, I have written of this before and need not write more at this time. What about alcohol? Alcohol is not a sin. Drinking is not a sin. In fact, most liturgical churches actually use alcohol, that is to say some variety of wine, as well as grape juice (for those who can not have or have trouble with alcohol), for communion. The amount of alcohol used is never very much. Part of that is because there are laws against driving while intoxicated. Part of it is because the Bible does say a few things about alcohol. Wait! Didn’t you say that the Bible doesn’t say anything against drinking alcohol? Yes. The Bible does not condemn drinking alcohol. However, it does condemn overindulgence. There are eleven verses that deal with drinking and being drunk. However, the only condemnation is with having too much wine (wine was quite common in Israel and the middle east, other forms of alcohol were likely known, but wine was so common that it is no surprise that no other forms of alcohol are mentioned). The best verse to highlight this point is Ephesians 5:18 which reads “And do not get drunk with wine, for that is debauchery, but be filled with the Spirit”. In it’s proper context, the writer to the church at Ephesus is explaining how the people should live their faith, warning against all manner of sin. The author also took care to remind the people of how they once had lived, just as those who did not believe. Now that they are no longer living in spiritual darkness, they were being cheerfully admonished to discern what is the will of the Lord. To that end, they were being warned against drunken behavior, which is what too much alcohol tends to lead to. Incidentally, it is worth noting that the church at Ephesus was also encouraged to greet one another with psalms and hymns. Now I wouldn’t suggest that we greet everyone that way. However, if we know that somebody believes as we do, then I see no reason not to greet somebody in that manner. Indeed, the common phrase I hear in church is “The Lord be with you”. The typical response is “And also with you”. So what then? Too much alcohol is a bad thing. This should be obvious. However, there is nothing to forbid drinking alcohol from time to time. The Apostle Paul even admonished Timothy to drink wine to help his stomach, though I would like to believe that Paul would recommend some moderation. Let it be noted that when Christ Jesus took the cup, blessed it, and gave it to his disciples, he said something specific about it. Namely that it was his blood shed for them (and us) for the forgiveness of sins. Yes, Christ Jesus said that the wine was his blood for the forgiveness of sins. Oddly, he never said that it represented his blood, only that it was his blood. However, I’ve covered that elsewhere. Getting “loaded” with alcohol can have dire consequences. Being “loaded” monetarily may or may not be a good thing, depending upon how you view money. A properly “loaded” trailer at the end of the night is a good thing, for both you and your employer. However, some discernment and moderation are appropriate with this. Oh, I almost forgot. 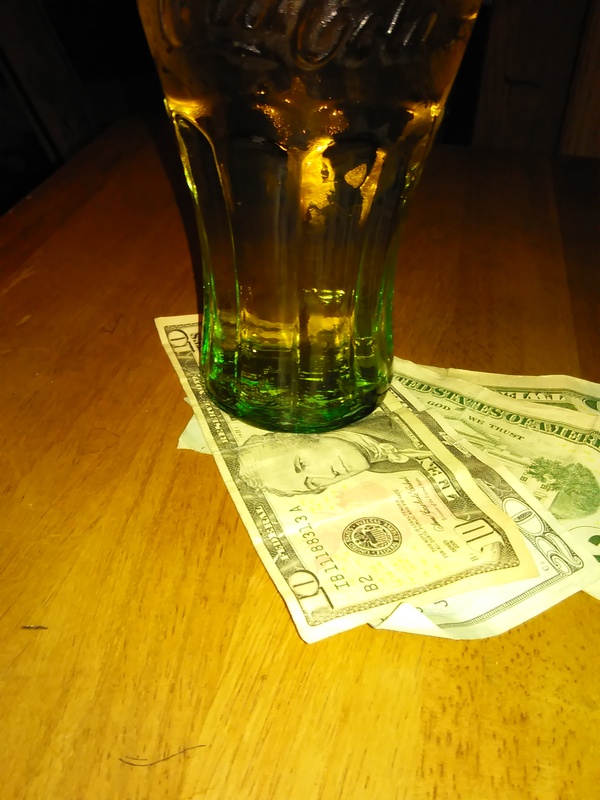 That picture is a beer and my gas money for next couple weeks. Honestly, I’m not planning on getting loaded, one way or the other. This entry was posted on 02/08/2015 by Christopher Rose in Discernment, Law and Gospel and tagged alcohol, Bible, Christ Jesus, drunk, Ephesians, forgiveness of sins, Money, trailer.